Rich seas and a climate ideal for vegetables & rice result in a most elegant, healthy and delicately flavoured cuisine: the emphasis being on texture. Fresh Japanese ingredients are expertly seasoned with dashi stock, shoyu soy sauce, gomashio, sansho pepper and the fiery wasabi. Simplicity is key when using Japanese ingredients to create a balance of flavours, textures, colours and beautiful presentation. The traditional formula for a Japanese meal is known as soup and three, which comprises a meal consisting of a soup, a superbly fresh uncooked fish (sashimi), a grilled dish and a simmered dish. These are accompanied by rice, pickles and tea and consumed using chopsticks. The main barrier to learning Japanese cooking is the plethora of unfamiliar Japanese ingredients. Understanding them is becoming easier with the wealth of information available and the ability to buy Japanese ingredients online. Japanese spices include the seven spice blend called Shichimi Togarashi which is sprinkled over Udon noodles and soups or used as a general seasoning. 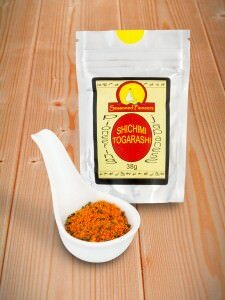 Togarashi is the name of the red chillies in the blend, which are mixed with the other Japanese spices of black sesame seeds, Sansho pepper, ground ginger root and white sesame seeds. These are then blended with dried orange peel and Nori flakes, resulting in the seven Japanese ingredients that translate as Shichimi or seven flavours! When buying your Japanese ingredients online, don’t forget to order Wasabi, the wonderfully fresh tasting, pungent and cleansing Japanese spice that has a resemblance to horseradish. 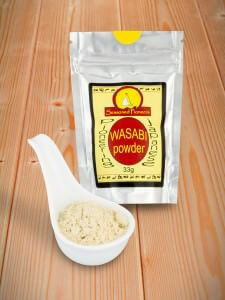 Available as a powder, it is simply mixed with a small amount of water to make a smooth paste served with sushi and sashimi. Goma Shio is another Japanese ingredient that perfects a Japanese dining experience. 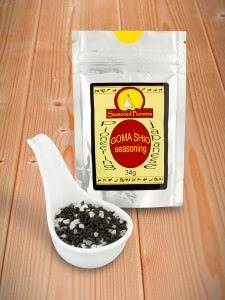 Used as a table condiment, this blend of sea salt and black sesame seeds is an authentic Japanese seasoning that can be used to enhance the flavours of any exquisite Japanese dish that graces your table. We hope that this inspires you to buy Japanese ingredients online and if you would like any further assistance, then please do not hesitate to contact us.